As a San Diego native with a head full of beautiful ringlet curls, Tricia knows the challenges of managing unruly hair with an active lifestyle. She uses her 20 years of experience to provide gorgeous, everyday looks for her clients and focuses on educating them on how to achieve their favorite looks quickly. She specializes in cutting curly hair and is a talented colorist, especially proud of her skill with reds. Tricia has extensive education in cuts, color and styling with TIGI, Vidal Sassoon, L’Oreal Professionnel and Bumble & bumble. Originally from Minsk, Belarus, Yelena’s passion for the industry began while working as a salon receptionist in high school, and she’s been honing her specialties including balayage, blondes, color correction and natural, glossy highlights ever since. 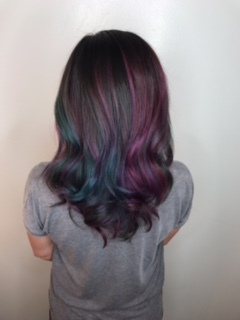 A stylist since 2003, she’s a beauty alchemist and a Business of Balayage Educator who loves using color and makeup to make women feel their most beautiful. Yelena creates a look that is conducive to her clients lifestyle and hair type, and teaches them how to recreate it at home, providing a satisfying experience both in the chair and in-between visits.